Wow, the baby Cardi nals have grown a lot since last week! Their eyes are now open and they are getting some little feathers on top of their heads. I just hope they don't get the mites from their father! I had to snap a couple of photos very quickly, mom and dad were not happy about me being so close to their babies. They will be leaving the nest before I know it! Right now, they are keeping their parents on the go constantly looking for insects to feed their hungry youngsters. 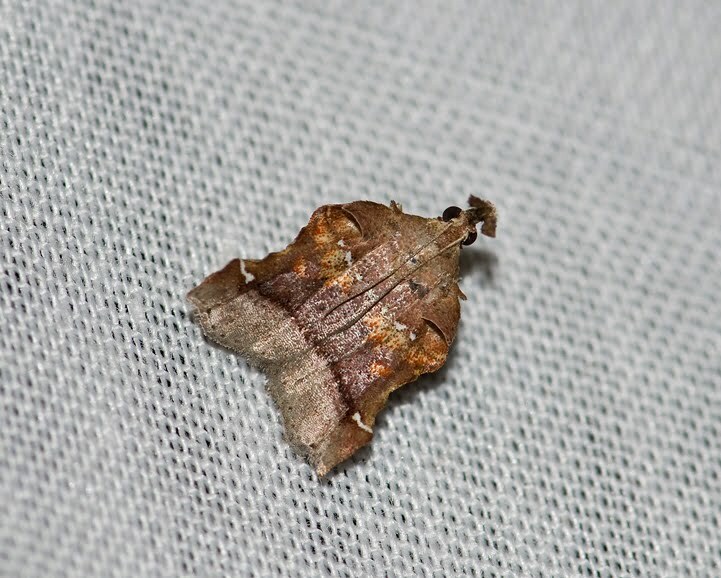 Last night while I was hunting moths I saw something on the porch light th at looked like a dead leaf. I knew that couldn't be, so I got my jar and caught it and coaxed it onto the sheet. I'm getting better at this every night! :) The critter turned out to be a Trumpet Vine Moth, a very strange creature indeed. 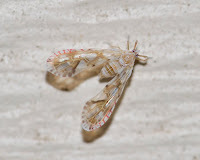 I also got a good photo of a Cottonwood Leafminer Moth (left), not an easy thing to do because they are only 3 mm long! 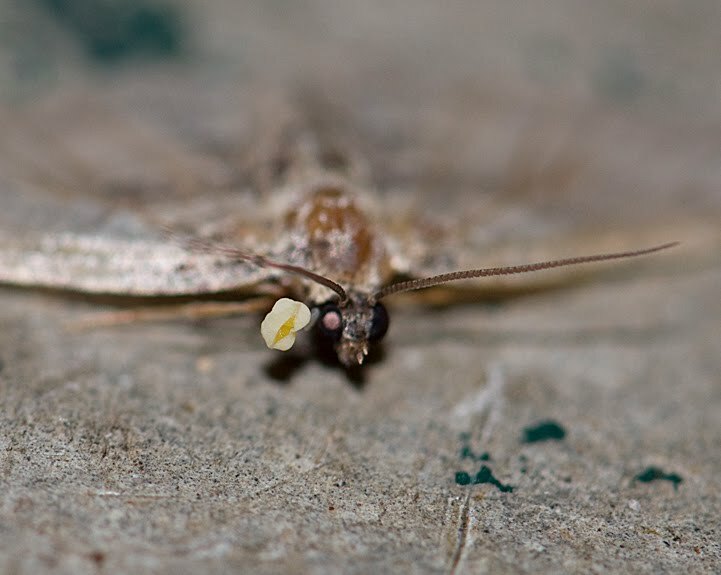 I also noticed a moth that had something attached to its eyes. It was light yellow and on a little stalk. When the moth flew from the wind ow to the carport, I was able to get a better photo of the "parasite" thing. Of course, I had to lay on my stomach to get the picture! When I saw it from the front I could see that the thing had split open and 2 yellow spheres were visible. I don't know if they are eggs from a parasitic insect or what. If I find out, I'll post the information. 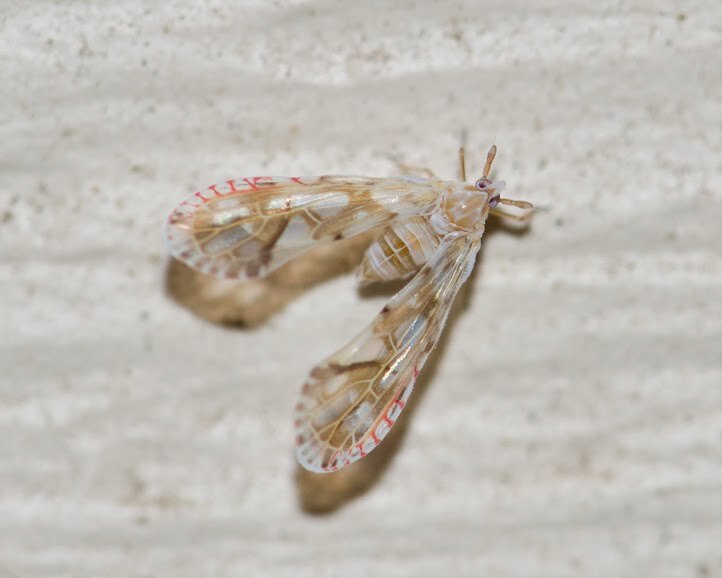 I also saw a funny looking planthopper on the wall. 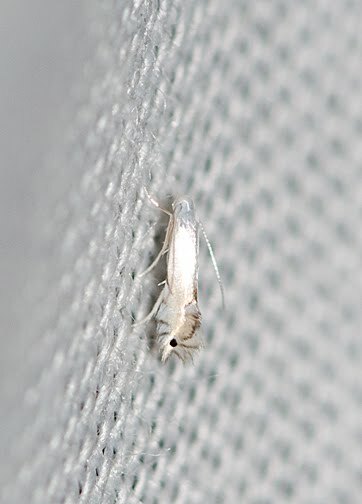 I'm always amazed when I zoom in on a little insect with my 105 mm macro lens, it opens up a whole new world. The wings are HUGE in comparison to its body size! 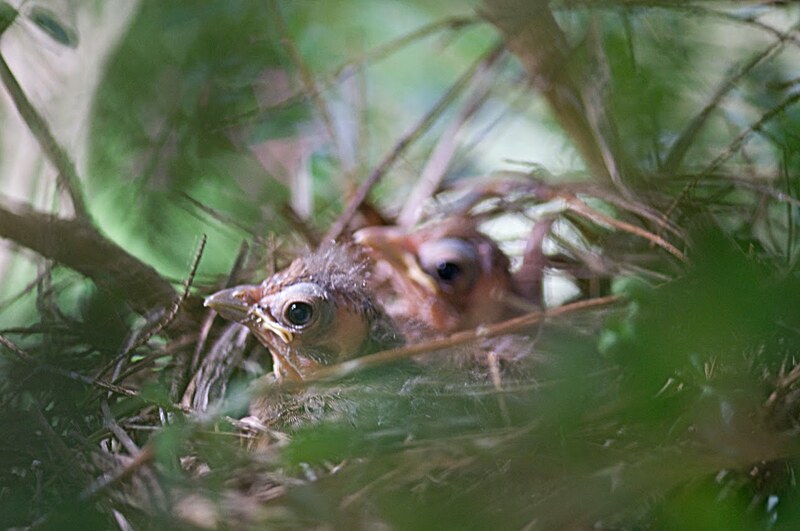 Those baby cardinals are so cute; can't wait to see them with more feathers! The baby cardinals "flew the coop"!